Category: Academic Staff (AS), Faculty (FA), Limited Appointees (LI), Student Assistants (SA), Post Degree in Training (ET), Other (OT). This knowledge base document provides an overview of the Job Employment and Management System (JEMS) Hire portal. It also provides details about functions/tabs that are used on any hire, rehire, transfers, or multiple hires made in the JEMS Hire portal. Click the Hire/Transfer button to start a newhire or transfer (used for transactions that do not require open recruitment or have approved waivers). Click the Summer Hire button to create a summer session/service appointment for a currently active C-Basis employee who will be on a "Short Work Break" from their academic year appointment. Click the My New Hire Basket button to see the Hire/Transfer employee records requiring review or completing hire transactions that require open recruitment. By clicking the My New Hire Basket button, the below screen appears. 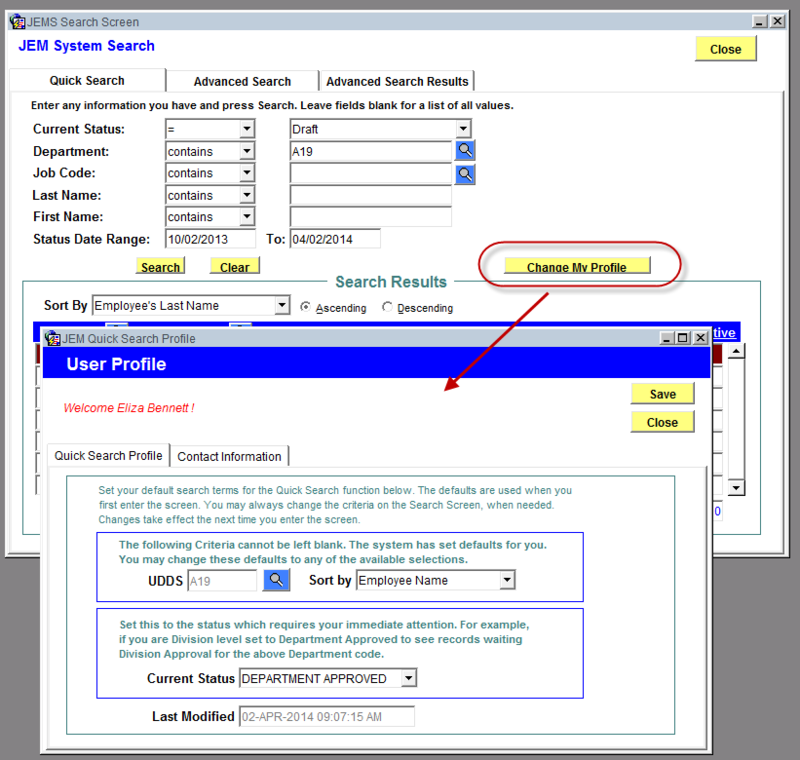 The first time logging into the JEMS HIRE portal, a default search profile is set-up. The default is composed of the assigned Department/Division authorization with the 'Current Status" of 'Draft'. This default it also loaded into the Quick Search Criteria and will automatically populate anyone in this status. If there are no records in this status then the following message appears: 'No Records Were Found'. To change the default click the Change My Profile button (middle of screen) and update. The first tab on the User Profile screen stores the default into the 'My Basket' default criteria (example below). See 'Helpful Hints' below for suggestions on recommended settings. 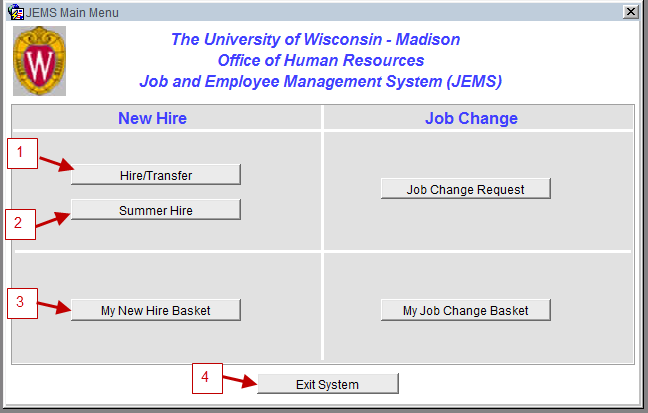 Department Level Staff - Set the 'Current Status' to default to <Blank> to see all department employees that are in JEMS Hire at the various statuses. Division Level Staff - Set the Current Status to default to <Department Approved> to see what is in your basket that needs review and immediate attention. The second tab on the User Profile screen stores contact data. 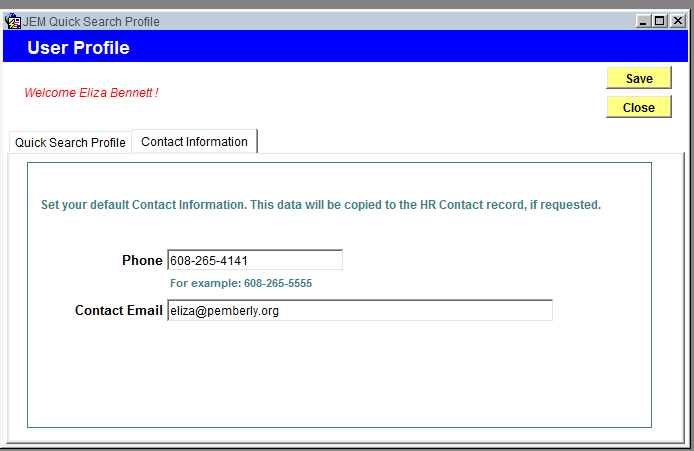 This data can be used to populate fields on the HR Contact tab. 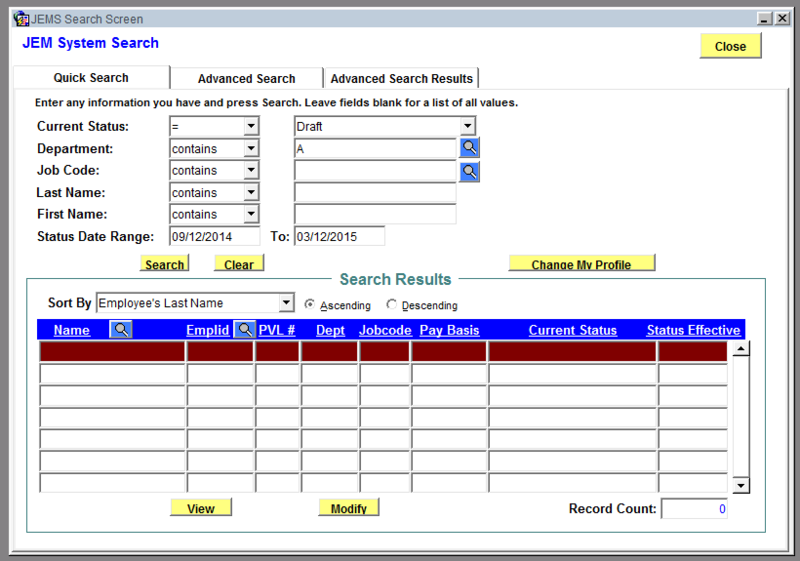 The Advanced Search function provides several additional criteria that can be used to locate a JEMS Hire records. 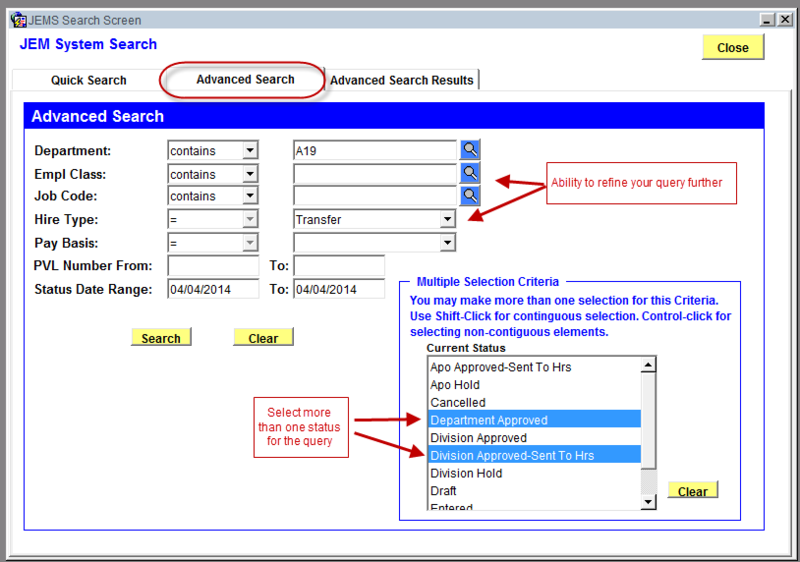 Search for records in more than one status by selecting multiple options in the Multiple Selection Criteria section. The Search Results can be viewed online or printed as a .pdf (Adobe Acrobat viewer required) or spreadsheet format (Excel application required). Fill in one or more of the fields (Empl ID, Name, SSN#) in the top search section. 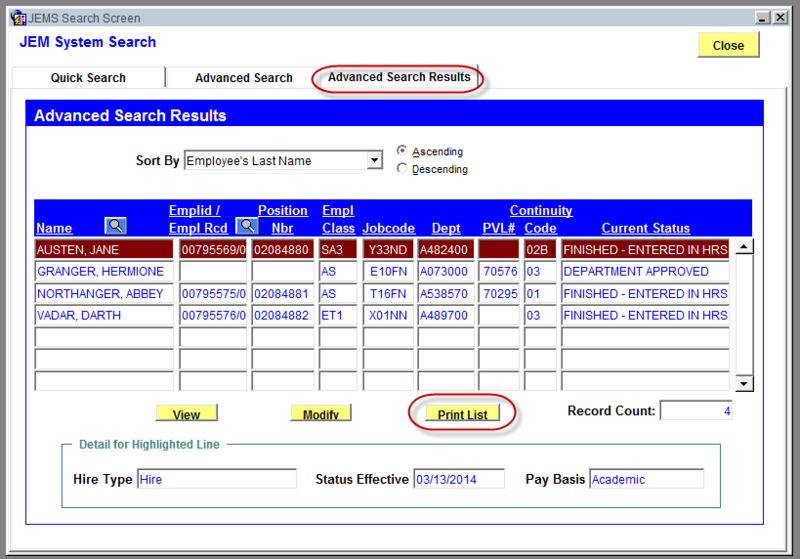 Click the Search button to search the system (searching in JEMS uses information from IADS, EPM and HRS). 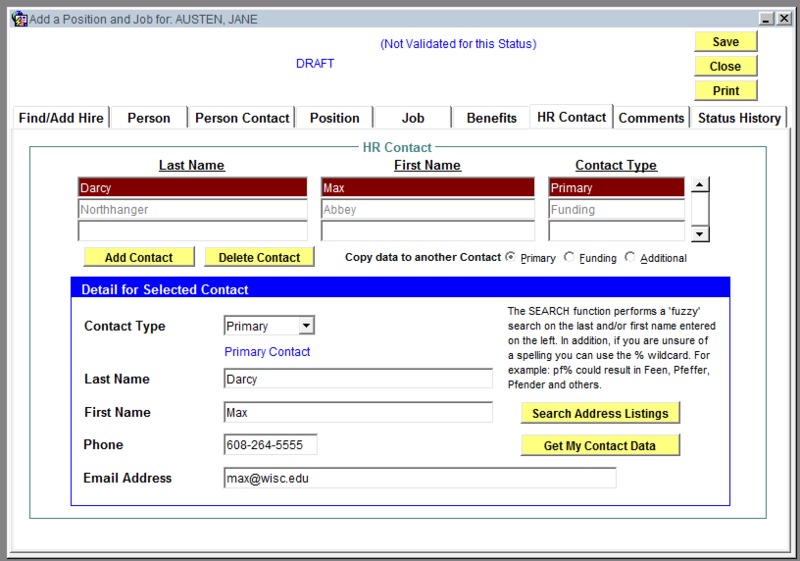 Check the Select box next to the person you would like to use (Review HRS - UW Multiple Jobs Summary to select correct person). This tab stores information about one or more person(s) who may be contacted about the appointment (additional contacts can be listed). Start with clicking the Add Contact button to add or modify the entry fields in the bottom portion of the screen. Paid positions require a primary and funding contact. Zero dollar positions require a primary contact. The data on this tab is not modifiable. It displays the history of statuses that a particular hire has had. 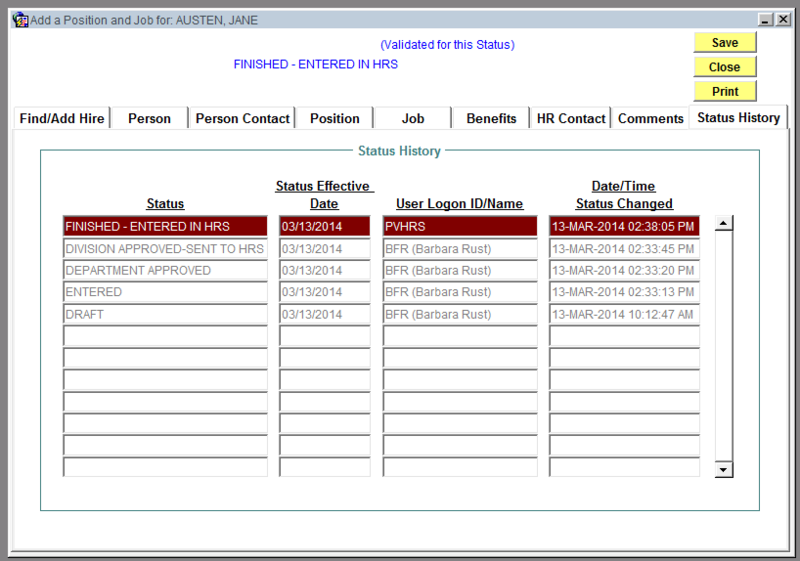 Anyone with update or view access can view the status history of the appointment. Statuses are shown in descending order. 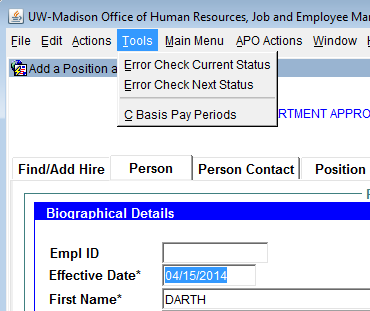 Drop Down Menu - "Actions" and "Tools"
The <Actions> menu is used to change the status of the hire record. Grey-ed out statuses are unavailable to the user. REJECT will return the Hire record to the prior status. This does not send out an email to the previous person who submitted the hire transaction. 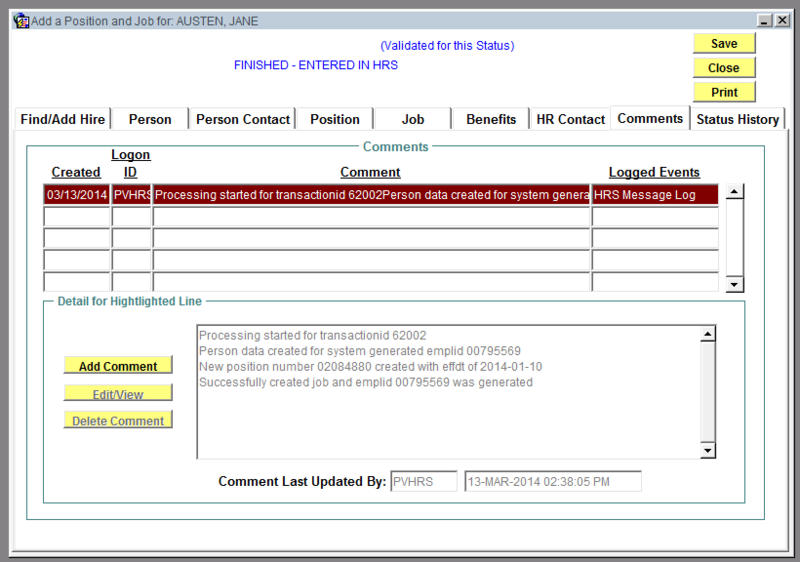 Error Check Next Status -- Each status has requirements for data completion. For example, there are data fields that must be completed before the record advances past Department level. 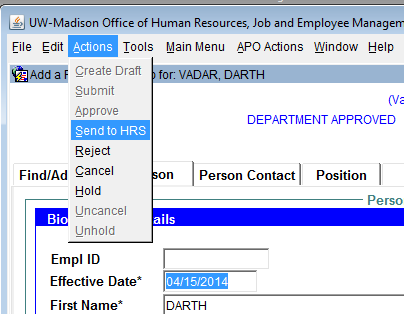 In addition, there are data fields that must be completed by the Division before submission to HRS. Use this selection to find any errors one would encounter if trying to advance the status of the Hire record without requesting a status change.